Strategic Response | DE General is the Southeast region’s premier disaster restoration company for both commercial and residential losses. We are ready and able to respond in your time of need. In most cases, we can guarantee you 24 hour emergency service for an initial disaster recovery assessment. We can handle your claim from start to finish including wind, flood, water, mold or fire damage restoration, structural and interior demolition, environmental abatement or environmental solutions and soil remediation. We are fully licensed general contractors in Alabama, Florida, Louisiana and Mississippi. We also have a vast network of subcontractors and suppliers in each of these states. DE General's continued success is due to our highly trained staff, our stellar track record and our long term financial stability; we are fully bonded and insured; carrying $2,000,000 in general liability and worker's compensation coverage. The members of our Disaster Response Team are on call and prepared to respond to a disaster site anytime; usually within 24 hours. Our environmental services are the best in the industry and include toxic mold and fungi, asbestos, lead paint and lead dust, demolition and infectious disease control. Our disaster readiness plan is in place, allowing us to mobilize our team of professionals, and load our vast inventory of equipment on our trucks at a moments notice. 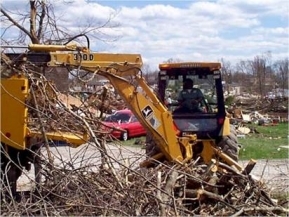 With one call to DE General, your emergency becomes our emergency and we will respond with the skilled personnel and correct equipment anywhere in the greater Southeastern United States to direct your emergency mitigation needs and complete your restoration and reconstruction process.